← 223 "The Old Man and the "C" Student"
"I have neither been there nor done that"
Monty Can't Buy Me Love is the twenty-first episode of Season 10. It originally aired on May 2, 1999 and was written by John Swartzwelder and directed by Mark Ervin. Michael McKean guest stars as Jerry Rude. "Mr. Burns tries his hand at winning the public's admiration by taking part in blue collar radio talk shows and retrieving the legendary Loch Ness Monster." While on a family hike, Simpson family discover a new mega mall named "Fortune Megastore". It has all their needs and desires. The opening for it has drawn a big crowd; Mr. Burns, who's taking a ride in his car, cannot pass through the crowd and decides to see what the hullabaloo is about. Once he enters, Mayor Quimby announces a very special person has entered. Burns is flattered that they would notice him, but they are really announcing billionaire-tycoon Arthur Fortune, the owner of the store, who, as a crowd pleaser, gives them all free money. Mr. Burns is sad that he is not wanted. Mr. Burns decides to win their attention back by enlisting a citizen, Homer, to help him gain the town's eye. First they try to copy Arthur by throwing the town money, but they choose to throw silver dollars off a tall building, resulting in physical and bodily damage to the citizens. Next, Mr. Burns asks Homer to bring a check from himself to the Springfield Hospital. He later finds out that they didn't take the check under Burns' name, but under Homer's, and Homer ends up getting a wing named after him. Then, Burns goes on a Howard Stern-type radio show called "Jerry Rude and the Bathroom Bunch", but he is appalled at the questions and embarrassed when the host makes farting noises. Burns has had all he can take and decides to do something no one's ever done before - find and capture the Loch Ness Monster. Burns has enlisted the help of Homer, Groundskeeper Willie, and Professor Frink to capture the monster. After several attempts of locating it, there is no success; Burns decides to empty the loch. Lo and behold, they find the monster. The younger men of the group are a little too scared to try and capture the beast. Leaving Burns to somehow singlehandedly best Nessy and get it into a harness on the helicopter. They bring it back to Springfield. During his unveiling, a camera crew starts taking pictures. The monster likes the attention, but Burns goes crazy due to the bright flashes and drives everyone away. 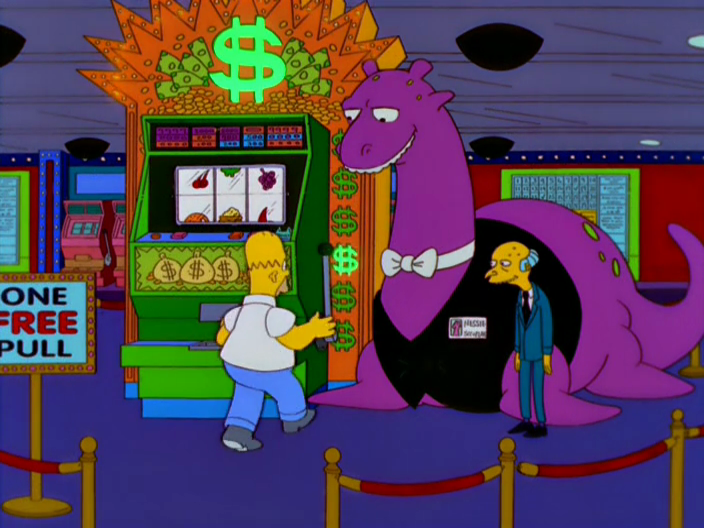 With nowhere to go, Burns decides to get The Loch Ness Monster a job at a Vegas casino. The concept behind the episode came from an issue of The Economist, which had a story about "thrillionaires", millionaires who perform incredible stunts and go on amazing adventures. The third act of the episode had many ideas thrown about until they ended up with the final idea, conceived by George Meyer. According to current showrunner Al Jean, the Loch Ness Monster was originally supposed to be green but after overseas animation was completed, it looked more pink than green, so they stuck with that as it was too expensive to recolor the cels. "Monty Can't Buy Me Love" currently holds a 7.2 rating on IMDb and an 8.1 rating on TV.com. ↑ Hauge, Ron. (2007). Commentary for "Monty Can't Buy Me Love", in The Simpsons: The Complete Tenth Season [DVD]. 20th Century Fox. ↑ Jean, Al. (2010). Commentary for "The Lastest Gun in the West", in The Simpsons: The Complete Thirteenth Season [DVD]. 20th Century Fox. Modified on August 1, 2016, at 04:29.